Pets are very essential in our life. Having a microchip cat flap ensures no unwanted animals get into your house and your cat will be able to exit and re-enter the home being the only animal with a microchip that has been paired to the flap and will be able to get in. Provide pets with a portal between two different environments – usually the indoors and the outdoors. This provides pets with a greater freedom of choice and extends the areas in which they can self-exercise and explore. Increased exercise, fresh air and opportunities to investigate, fulfilling your cat innate requirements and stimulating them psychologically as they venture through the cat flap. Keeps your cat safely indoors whilst others are kept at bay by use of microchip flap. Intruding cats are a significant cause of stress for resident cats. Using the microchip feature helps keep out unwanted strays preserving the resident cat’s core territory within the home. Measure the distance from the ground to the pet’s belly and make that measurement from the ground up, onto the door – this makes sure that the cutting template is positioned correctly and that the cat flap is the right height for the pet. Using the cutting template as a guide, use a drill and jigsaw to cut the hole in the door (except for glass fitting in which instance you should consult a glazier). Make sure the locking mechanism on the microchip cat flap is on the right side of the house (inside or outside) and ensure your cat is microchipped for easy programming and entry. We have tested 8 best microchiped cat flaps that are good for your homes outlined below. The SureFlap Microchip Cat Flap uses your cat’s existing identification microchip as and electronic door key, allowing access to your pet and making unwanted visitors a thing of the past. 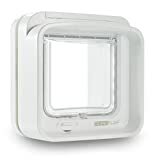 The microchip cat flap is suitable for small and medium sized cats. It can be installed in doors, windows or walls with the appropriate mounting accessories. It reads the unique code on your pet’s microchip or collar tag as your pet’s microchip is then permanently stored in memory. Selective entry-Works with your cat’s existing microchip to keep out intruder cats and wildlife. Compatible with 9, 10 and 15 digit microchips. No collar or tag is required to operate the SureFlap, which can get lost or snagged. Runs off 4 AA batteries which last up to a year with normal use. Stores up to 32 pet identities in memory. Remembers all registered cats even when the batteries are removed. Includes 4-way manual lock for controlled entry and exit. A low battery indicator will flash when the batteries need changing. The cat flap remains locked for unwelcome cats and wildlife. 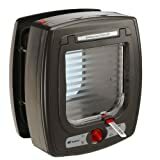 The SureFlap Microchip Pet Door identifies your pet by using its existing unique identification microchip or RFID collar tag (one tag supplied with the product), unlocking only for your pet and leaving intruder animals at the door. Suitable for multi-pet households as it can store up to 32 pets in its memory. It is designed for large cats and small dogs. To fit through the pet door, your pet’s shoulders should ideally be no wider than 6 and a half inches and the circumference of their waistline at its widest point should be no more than 20 and a quarter inches. It is programmed at the touch of a button and it can be installed in doors, windows and walls. For wall installations one or more tunnel extenders may be required and a mounting adaptor for glass installations. 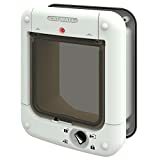 The SureFlap Microchip Pet Door is battery powered using 4 C cell batteries which last up to a year with normal use. When the batteries start to run low, an indicator light will flash to inform you. This cat flap has a double antenna, which reads a cat’s microchip when it comes into and goes out of the house. This allows you to restrict certain cats to indoor-only, whilst allowing other cats’ access to the outdoors. If your cat is not microchipped, the dualscan cat door can also be used with a SureFlap RFID Collar Tag and can store up to 32 cats’ identities. A SureFlap Cat Door Mounting Adaptor is required for glass installations and one or more SureFlap Cat Door Tunnel Extenders may be required for wall installations. It is battery powered using 4 AA batteries which last up to a year with normal use. Comes also with a 4-way manual lock to enable locking to any combination of in/out and a central magnet on the door prevents it from flapping in the wind. Works with your cat’s existing microchip to keep out intruder cats and wildlife. The double antenna reads your cat’s microchip in either direction to keep indoor only pets inside. Safety learn mode for indoor only cats ensures they can get back inside if they escape through an open window. Due to extra mounting adapter suitable also for glass doors. Can be programmed for up to 32 cats. Transparent flap, low noise level. It is compatible with 9, 10 and 15 digit microchips. Learns your cat’s unique identification microchip number to provide secure access for your pet; keeps unwanted visitors out of your home. You do not want unwanted pets in your home get pet safe which flap exclusively opens for your Pet, then locking once they are safely inside hence preventing curious or unwanted animals from entering your home. 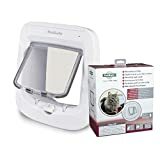 You do not have to subject your cat to uncomfortable collar keys, as this Cat Flap, works with most Microchips, unlocking once they are detected. The initiative recognition system is ideal for homes with multiple Pets as the Microchip Cat Flap can be used for up to 40 Pets. Allowing Owners to oversee their Pet boundaries, the 4 Way Locking System can be adjusted to control your Cat roaming. Draught excluder and two Magnetic Closing Locking points increase Insulation and energy efficiency. Reinforced, dual auto-latch with 4-way manual lock. Easily adapts to cut out sizes for Staywell and Microchip Petporte cat flaps. Cat flap requires 4 new AA good quality, non-rechargeable alkaline batteries (not included). Battery life up to 12 months expected. For Installation into Doors containing Metal, Glass, PVC, Brick or Walls, the purchase of a PetSafe Installation Adaptor and Tunnel Extensions is recommended. Easy to programme for up to 40 micro-chipped cats. For selective entry control, operated by your cat’s unique implanted identification microchip the cat mate microchip cat flap has been developed to offer the ultimate solution. This eliminates the stress and frustration caused by the unwelcome intrusion of neighbouring cats, providing a safe and secure environment for your cat. It is easy to program and up to 30 cats can be registered. For cats without an implanted microchip, a unique Cat Mate I.D. Disc can be attached to your cat’s collar (available separately). The easy to use, rotary 4-Way lock gives complete control over your cat’s access to and from the house. The streamlined design of the Cat Mate Microchip Cat Flap maximises entrance opening space – providing easy, stress-free access for your cat. The brush sealed flap with magnetic closure ensures a draftproof and weatherproof seal. The cat flap can also be easily fitted to walls or glass panels with an adapter kit (available separately). The Cat Mate Microchip Cat Flap is battery powered and will give approximately 12 months operation from 4 x AA batteries (not included). The LED indicator flashes with a short pulse every 30 seconds when the batteries are in need of replacement. Can works well with a treat and so easy to program if your cats have been microchipped and this only lets them in the house after programming the door to their chips. What a brilliant idea. Entry operated by your cat’s implanted microchip – keeps stray pets out. Compatible with 9, 10 and 15 digit microchips – registers up to 30 cats. Easy to program, at the push of a single button. Easy to use, rotary 4-way lock. Requires 4 AA batteries (not included) which will give approximately 12 months operation. Covered by a comprehensive 3 year guarantee. 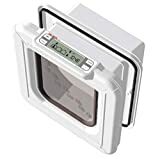 Love this cat flap, so simple to set up, takes 4 batteries no separate box like the more expensive cat flaps, which need plugging in near the cat flap. This is a simple one you just run the cat flap over your cats head to pick up the chip. Or if yours is not chipped run the tag through the cat flap and attach the tag to your cats’ collar. It can hold up to 30 different chips which is good if you have lots of pets. It has been developed to offer the ultimate solution for selective entry control, operated by your cat’s unique implanted identification microchip. The streamlined design of the Cat Mate Microchip Cat Flap maximises entrance opening space – providing easy, stress-free access for your cat. The flap is sealed with a brush edge so no draughts. They are other cat flaps that can accommodates less cats, if you want one for few cats get a microchip cat flap with a timer control suitable for up to 9 Cats. It is Compatible with pre-implanted microchips or with an RFID collar tag. Suitable for doors or walls up to 100mm thick (a separate tunnel extender for thicker doors is also available to purchase). 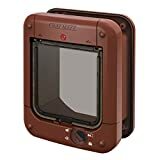 The Cat Mate Super Selective Chip and Disc cat flap reads implanted microchips as well as the Cat Mate RFID collar disc so it is ok if your cat has any. It has Access control: entry only via implanted microchip or RFID collar disc. Timer controlled access recognizes up to 9 individual cats with 4 way lock system. LCD show location of 3 cats and when the last cat used the flap. Keeps uninvited visitors such as unknown cats and other animals out of your home. Easy-to-programme four-way control pad: Unlocked, In Only, Out Only, Locked. Time of last use/current whereabouts: an LED-display showing whether your cat is currently at home or on the move, as well as the last time the flap was used (up to 3 cats). Allows you to set specific time periods in which the cat flap can be used, based on your own specific need. Durable as it is made from super tough polymer. Can be installed into wood, walls, metal doors single/double-glazing. Access with implanted microchip or collar ID Disc (not included). Requires 4 AA Batteries 9-12 months use. LCD Display shows selected entry and exit lock status, cat location and time flap last used for up to 3 cats. Self-lining up to 4 inches, ideal for most types of installation. Fully draft and weatherproof brush sealed flap. Frame Rain Seal. Swing Microchip is a cat flap equipped with a fantastic microchip system! Its innovative antenna detects your cat’s microchip, its memory button records the microchip code: the flap will magically open when your animal is approaching. Swing Microchip is made from robust plastic, complete with wind-stopper system and 4-way locking system. In the lower part of the flap, there is a last passage direction indicator. Reliable and easy to use. It is battery operated (batteries not included); a low charge indicator will indicate when batteries have to be replaced. Very versatile, swing microchip can detect up to 32 ISO standard microchips, is easy to be installed in many different structures and materials. If your cat does not have a microchip implanted, the flap can be used in combination with the suitable nylon collar with microchip, included in the package. Special antenna detecting your cat’s microchip. Can record up to 32 standard microchips iso all over the world. Wind-stopper system and patented last direction indicator. Easy to use, battery operating, low charge indicator included. Nylon collar with microchip also included. Cats are wonderful pets and if you do not want a strange animal in your house at night ravaging through my dustbin for any leftovers get a microchiped cat flap. Raccoons and neighbours cats can be a big headache in your homes if you just have a traditional cat flap. Microchip cat flaps will ensure your indoor-outdoor cats can be able to go in and out at will and keep other creatures out and give you peace of mind.